Bank of the West title after trailing 5-1 in the first set. Perhaps the defining mark of a champion is the ability to play one's best under pressure. Serena Williams showed her mental toughness again today at Stanford, defeating third-seeded Angelique Kerber of Germany 7-6 (1), 6-3 for her third Bank of the West title. Williams, who will be ranked No. 1 for the 200th (non-consecutive) week on Monday, overcame a 5-1 deficit in the first set and two set points at 5-2. "When I was down 5-1, I was just thinking I had to take it one point at a time," Williams, a product of Compton in the Los Angeles area, said on wtatennis.com. "I knew I just had to relax and not be so crazy. Up until that point, I wasn't doing what I wanted to do, and what I had been doing in practice, so I knew I just had to start doing the right things going forward." Bank of the West fans have seen this repeatedly. Today's match was similar to the 2012 final, in which Williams survived a set point in the first set before beating lucky loser CoCo Vandeweghe 7-5, 6-3. Williams, who also won the Bank of the West Classic in 2011, did not return last year. This year, Williams was tied at 5-5 in the opening set against hard-serving Karolina Pliskova, 6-foot-1 (1.86 meters), in the second round and against former top-10 player Andrea Petkovic in the semifinals. Williams won both matches in straight sets, capturing eight of the last 10 games against Pliskova and the last eight games against Petkovic. Williams, who received a first-round bye, dropped the first set of her quarterfinal against former world No. 1 Ana Ivanovic but rallied to win. Kerber, who has won three WTA singles titles, fell to 0-4 in finals this year and 1-5 lifetime against Williams. 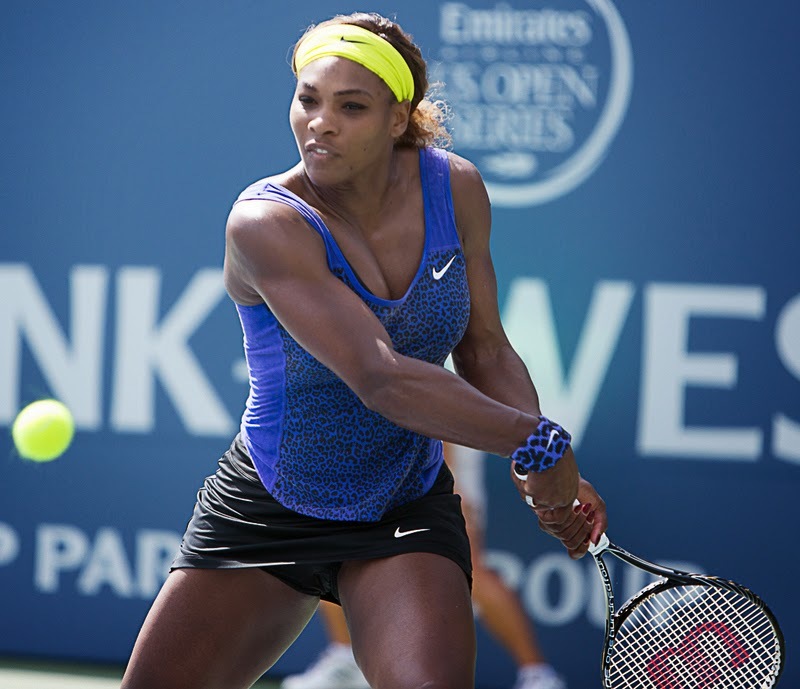 Although Williams leads the WTA tour with four singles crowns this year, the 17-time Grand Slam singles champion has failed to reach the quarterfinals in the first three majors of 2014. The Bank of the West Classic was her first tournament since she retired from her second-round doubles match at Wimbledon with dizziness caused by a "viral infection." 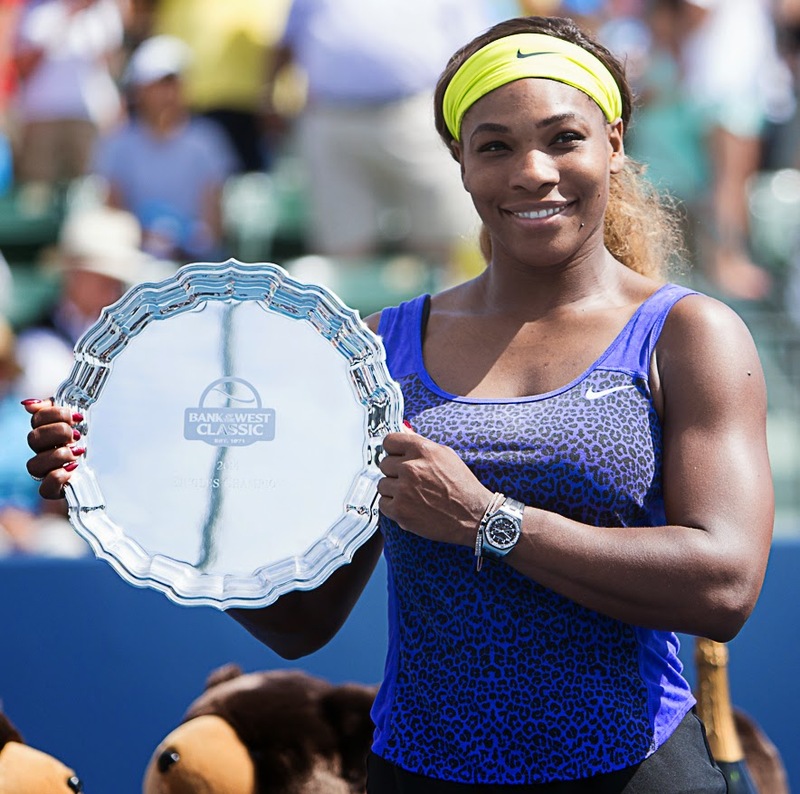 "I feel like I'm on the right track again," Williams, 32, said after her 13th consecutive victory at Stanford. "I feel like I can play even better -- I wasn't serving my best, and I wasn't making as many winners off the return as I wanted to, but I think I'm getting there." Winning the U.S. Open, which begins Aug. 25, for the third straight time and sixth overall would ease the disappointment of her early Grand Slam exits this year. "It would definitely make it better, but it wouldn't make it go away," she admitted. "It would definitely be great, but right now I'm just focused on the next tournament, which is in Toronto." "I mean Montreal!" she said of the women's Rogers Cup, which alternates between the two Canadian cities with the men's tournament. "I definitely won't go to Toronto. I won't win a match there!" In the Bank of the West doubles final, third-seeded Garbine Muguruza and Carla Suarez Navarro of Spain edged Paula Kania of Poland and Katerina Siniakova (pronounced Sin-i-ko-vuh), 18, of the Czech Republic 6-2, 4-6 [10-5]. It was the 20-year-old Muguruza's third WTA doubles crown and the 25-year-old Suarez Navarro's first.